Some politicians do their best talking as they leave politics or depart from a leadership position. Former Labor leader Kim Beazley was one example. The best final speeches are reflective and free of the partisanship and electoral pressure that stop politicians speaking their mind. For once they can relax. There was some evidence of these good elements in former treasurer Joe Hockey's valedictory speech last week after 19 years in parliament. There was bipartisanship when he directly praised Labor for introducing the National Broadband Network. Indirectly, he also recognised Labor's focus on the problems with superannuation when he called for a bipartisan review of superannuation and pensions. There was also evidence of the freedom to offer strong opinions on policy in a range of proposals including support for a higher and wider GST and various other taxation reforms. It is always good to see some straight talking in parliament rather than the usual defensive hedging that the system of government and opposition demands. Hockey leaves parliament after a career symptomatic of the best and worst of modern politics. He is a relatively young man still, having just turned 50, and his young children were present in the House. He regretted that the demands of parliament made it hard to be a father who was attentive to milestones such as children's birthdays. He is one of those good blokes who leave parliament with a lot of goodwill across the chamber, proceeding quickly, it would seem, to a diplomatic post as Ambassador to Washington. 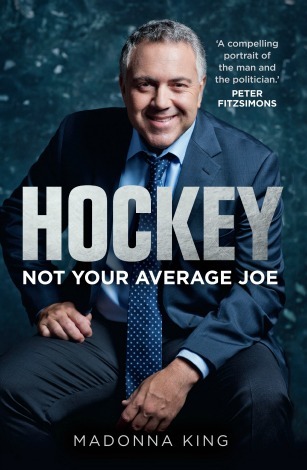 But in other ways Hockey's valedictory speech was disappointing because it showed that he just didn't understand the criticism which had led to the downfall of the Abbott government of which he was a leading member. Not only did he defend the unfair 2014 budget which did so much to damage the government but he did so in a way that was full of clichés and platitudes. Even if he was unwilling to admit the unfairness at the heart of that budget he should have done much better. Instead he fell back on two of the most abused political clichés going around. The first is the false distinction between policy and politics. The second is that it is better to be right than to be popular. He said that 'The Abbott government was good at policy but struggled with politics' and that 'When faced with a choice, I would always prefer to do what was right than what was popular'. He believed that his 2014 budget was too courageous for parliament. It is an easy out to say, as unsuccessful governments often do, that a government got the policy right but the politics wrong. Good policy, including implementation, is always part of effective politics, while poor policy is hard to spin no matter how good you are at politics. The public, expert interest groups, the state premiers and the parliament were not all wrong. They recognised poor policy. In fact, many aspects of that budget have now been undone by the very government that put them forward in the first place. There were aspects of poor politics in the struggles with the senate cross bench but at their core the government's problems lay in poorly conceived policies. The distinction between virtue and popularity is a self-serving one. I'm right and my opponents are populists. Sometimes popularity is undeserved and can be bought, that is true. More often popularity comes because the people recognise consistency and fairness in government actions even in hard times. There are two broader implications arising from Hockey's valedictory speech. The first is that his failure to reflect on the weaknesses of the Abbott government may be widely shared by his Coalition colleagues. They still don't understand the causes of the predicament they have made for themselves. The second is that if Malcolm Turnbull accepts Hockey's diagnosis then his government will be largely about better communication and more effective politics rather than refurbished policies. That may not be enough. Mr Hockey had the great good fortune of writing his own job description. Between 2011 and 2013, in Opposition, he identified 23 failings in Australia's economic management under Labor, and promised to rectify them. The 23 can be found in Mr Hockey's speeches on the Liberal Party website, and have been listed elsewhere in the alternative media. Unfortunately, after just two years, during which the global economy advanced strongly, all 23 of those variables have deteriorated. There is not one single advance. So here's the question: is this the result of the incompetence of the Coalition Government's first Treasurer, or of the very nature of the Coalition's economic program? I have often wondered if some of the Abbott-Hockey doggedness in the face of opposition to their policies came from a DLP notion that "We are doing God's work and God will not let us fail". For the righteous the strength of the opposition to their views convinces them they are right. And I thought that Hockey's errors were the lack of empathy including allowing a cold Mathias Cormann to say so much on his behalf. Judging by reports of his Margaret Thatcher speech, Mr Abbott himself seems yet to accept that his government was doing anything wrong; perhaps Mr Hockey is in a similar position? Recalling St John's College in the University of Sydney, when Mr Hockey was College President, the dominant economic paradigm was that of the 'New Right', championed by such industry leaders as Hugh Morgan and Andrew Robb in the pages of the journal that employed Tony Abbott, 'The Bulletin'; the young Joe Hockey would have been imbued with 'New Right' beliefs, but having studied as an Arts/Law student, Mr Hockey has never been in a position to critically appraise them. His fellow Arts/Law graduate Tony Abbott would be in the same position. a clergy colleague of mine who was once seconded as temporary secretary to the Australian Bishops' Conference told of being somewhat amazed at what he heard expressed at the 'party time' following the formal gathering. Maybe what is said about Joe Hockey's 'unharnesed' words is symtomatic of our mainly 'nice guy' bishops' situational pressures. We might have had a more 'saleable' 2014 budget if Messrs Abbott, Hockey, Cormann and Pine bah been more responsive to the ideas of Pope Francis than to the discredited trickle down notions of Margaret Thatcher.